Computer science drives innovation in the U.S. economy and society. Despite growing demand for jobs in the field, it remains marginalized throughout the U.S. K-12 education system. There are many reasons for this. As you well know, teachers are already stretched pretty thin, and often it seems like there's just no bandwidth to add something new to a very full schedule. Additionally, some schools have few or no computers and/or tablets for classroom use. But the earlier we introduce children to coding, the more comfortable they will be when presented with more in-depth learning opportunities in middle and high school. Also, early exposure to coding helps teach children how important it is to understand computers as the valuable tools they are rather than merely fun playthings. Even if you don't have a classroom full of future computer programmers, learning the fundamentals of coding provides students with skills that will serve them well in virtually any career they choose. 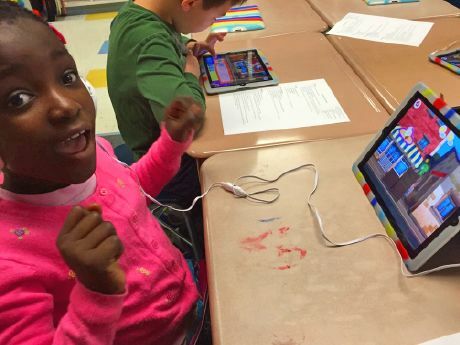 Plus, there are few things that ignite and excite a room full of learners like a coding class. Children want to learn how to code. They want to learn how to make tablets and computers do useful things. They want to learn how to build websites. It's actually a very cool thing to them. But what I want to focus on is breaking down the barriers to getting started in your classrooms. . . not some day, but right now. At J.Y. Joyner Elementary School, we’re lucky to have Jen Bell, our amazing technology teacher. Together, we've put together some advice to help you introduce coding to your curriculum, regardless of your budget or specific circumstances. There are so many educators and organizations that promote computer science. The resources available through Code.org alone are amazing. They offer curriculum and content, live chat or Skype sessions with professionals, and workshops that focus on teaching coding to young children. If you do one thing after reading this, go join the Code Studio for grades K-5 and try to attend a workshop ASAP. 2. Creating a 1:1 classroom isn't necessary. Don't be hindered by the misconception that every child needs his or her own device. Coding is a language which involves logic and problem solving, so working in pairs is actually a great way to increase production, develop collaboration skills, and allow children the opportunity to take on different roles in a partnership. In fact, there are many "unplugged" activities offered that don't use a device at all. Don't underestimate what young children are able to accomplish when educators let go of the wheel and allow students to become the drivers. Just adding one piece of computer science to your curriculum will get the ball rolling, and you'll get the feedback you need from your students to make it even better. If you're a teacher reading this post, there are certainly others like you who will want to implement something and maybe even work with you at your school. And of course, you can reach out to your students' parents and see if there are any geeks (like me!) who would be willing to help out and maybe even come into the classroom. Get those parents involved immediately! Speaking from experience, I can assure you that they will be tremendously excited when asked to share what they know. Choose age-appropriate resources that allow kids to progress and grow. Apps like Kodable, The Foos, LightBot, Run Mario Run, and Daisy the Dinosaur guide children through a series of puzzles and tasks that allow them make connections with minimal adult intervention, even without a computer (refer back to the Vicki Davis piece mentioned above for more ideas). Teaching young learners how to code on a large scale will help change the paradigm of children, and ultimately adults, from being technology consumers to technology producers. And that's precisely what our students -- and our country -- need right now. Don't wait for conditions to be perfect, or for that new batch of classroom tablets to arrive. Just jump in and take action today.